SO the big news this week, as covered by the Guardian, was the release of a deleted scene in storyboard and audio form, from this episode. 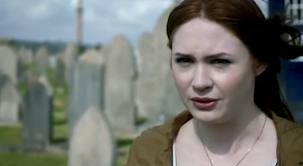 The Chibnall written scene gave Rory a chance to let his Dad know what happened to them, by letter delivered by an adopted son, resolving rather prosaically the thread of Amy’s infertility, in a scene clearly inspired by a similar event in Blink. The scene picks up on certain fan desires for resolutions somewhat underwhelmed by elements of this episode. I think there was an intense fan reading generated for this episode, but it seems to talk about alternatives. A desire for more resolution to the River Song/Amy aspect of the story, for instance, has people assuming Amy and Rory somehow meet up with young Melody in New York, filling in the gap between her 1969 New York regeneration and arrival in 90’s Leadworth. This companion departure was always going to be strained, deriving narratively from the Doctor’s feelings for Amy, and Rory, feelings whose motivations were made explicit for the first time last week, but have always been there. In review I mentioned The Power of Three‘s play with the format of the show, an experimentation enabled now the characters have been positioned to this point. The set up of Rory and Amy as, dare I say it, lame duck companions, by the coda of The God Complex proved both logical and potentially format-busting, raising the question of the whole status of a ‘companion’ in modern Dr Who. In some ways a consequence of the Doctor’s more perfect control over the Tardis, as much as any subtext that the Doctor must grow up, if you have a Doctor who is able to visit ‘companions’ at will, it disrupts the tradition of the companion role, into something more akin to another meaning of the word – an occasional traveller. As far back as the departures of both Captain Jack (The Parting of the Ways) and more especially Martha (Last of the Time Lords), the possibility has been raised of a companion leaving the Tardis, but not necessarily leaving the show. I always thought this was a great idea, and the use of the Ponds since The God Complex has satisfied this viewer’s desire for a more realistic and involved treatment of the format implied, but never realised, by how RTD re-imagined the Doctor-companion relationship in terms of an attachment to home and hearth. It lays possible groundwork I think for a more extended run of stories with occasional companions, perhaps those the Doctor has less of an emotional attachment to, so you don’t need to ‘write them out’ so artificially. Maintaining their base, these nu-companions can grab some agency in the series. 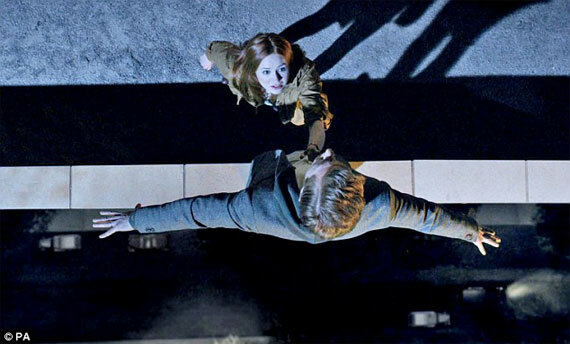 With Amy however he has made his feelings clear, finally: Pond will be there till ‘the end of me – or vice versa’. A constant companion. So a combination of that emotional thread, and the realities of life in TV land, mean an ending which ensures that somehow the Doctor cannot visit these people again is required. Some reviews have suggested this episode plays out like a series of plot devices to get us to that point, both emotionally and mechanically, with Moffat exercising his plotting muscles and interest in exploring time travel within Dr Who, rather than telling a story. Yet Moffat said the ending of this story – ‘the most important part of any story’ – was written and rewritten many times, to get it right. In public, this has been a mutable story with many possible paths not taken, a story with a public face of having multiple versions in the culture around it. Not that I didn’t enjoy the episode. I wasn’t expecting any further resolution to the Amy/Melody story, and I enjoyed appreciating it on its own terms. Pacing this year has been interesting. I loved the opening sequence. Much as I disliked A Town Called Mercy, I admired the pacing, a sense of the story slowing down at key points, for character to unfold. Here to me, the pre-credits sequence felt pleasingly like the beginning of a play. Some found the sequence wasted on a scene-setting mini-story whose characters proved entirely incidental after the credits, but I admire the unusual pacing going on here. And so, when considering if these elements were well used, I’m finding it hard to know if my judgement is clouded by knowing in advance, lacking the surprise necessary to judge them on their own dramatic terms. I shouldn’t read spoilers. I think I’ll stop now. I can’t help however in joining the chorus of disappointment towards the use of the Liberty Angel for pure ‘marquee’ effect. The appeal of the idea I think lies already in it’s audacious popular appeal, but to plonk it into the story without any visible means of support at all? Reminiscent of RTD’s Cyberking in London incident, which Moffat himself took the opportunity of his ‘crack in time’, swallowing both things and the memories of things, storyline to cover for. How is it not quantum locked? The episode proper presents a classic Moffat time puzzler The drama’s initial gambit, the kidnapping of Rory and his instant appearance in the book the Doctor is reading to Amy, certainly arrests and intrigues, but, as people are beginning to argue, Moffat’s distinctive use of time travel in Dr Who has a price when the basic rules in the show are so slapdash. The drama’s credibility suffers. While the incident in which Amy reads ahead succeeded for me in heightening the drama of the time paradox the Doctor and Amy had to negotiate. The drama of River’s wrist however, played out as a key emotional moment in that negotiation, played out poorly because of how poorly it fitted what Amy did read in the book. How did the Angels fare as a Dr Who monster here? Certainly creepy in a story which returns to their time-active abilities, it took me some time to realise there was no particular plan at work here, just an unfolding of Weeping Angel culture. There was no plot involving the Mike McShane character, no mystery behind who he was or his connection with the Angels and somehow I feel this was a weakness. Once we understand that, we can focus on the angels, the Doctor and co happening to cross paths with them in a city they frequent, and the tension of knowing Rory and Amy will not survive the story, according to contract, serving as the foregrounded plot. This took time to play out unlikely possibilities: Rory being the locus. So, an angel people farm. Again, great idea but the specifics didn’t bear examination. In an alternative story called The Angels Take Manhatten posited by some fans, the same ideas are rejuggled. The Statue as a permanently imprisoned Angel, always gazed at by someone in the insomniac city, with the angels out to free her was a Chinese whisper of a ‘spoiler’ trailed before the episode. The only sensible way to bring this about would be blinding everyone, Day of the Triffids style. Another alternative constructed after the episode prefers the Ponds final farewell to occur back in time, say 1969, with the Doctor (from earlier in his timestream, for timey-wimey fans), or perhaps River Song herself, guiding them to toddler Melody, to raise her before sending her on her way to Leadworth. Yes, there are still people who don’t get it. Melody survived New York because she was programmed to do so. She sought out the young Rory and Amy to be raised by them (in a way), because she was programmed to kill the Doctor, and to give at least some resolution to the whole storyline of Amy having her new born baby kidnapped. That timey-wimey sort of resolution was all we were ever meant to to get. That, along with Amy’s sub-Eastenders declaration to Madame Kovarian in The Wedding of River Song that “Melody’s all grown up now and she’s fine – but I’ll never see my baby again,” resolves the issue as far as the screen is concerned. The ending came down once more to the theme of Amy’s choice. It’s simplicity and suddenness appealed, her choice inevitable the moment Rory disappeared. She chose the angel, the route to live with Rory, over life with the Doctor. The Doctor was predictably gutted by this, and unfortunately River, who apparently is free to go sort out a publishing contract with Amy, isn’t much consolation. I really don’t understand why she says ‘one psychopath per TARDIS’ as a reason for not joining up with him full time: if it is a joke I don’t get it. Interpersonal relations in Moffat’s Who are…unusual. Of course, the ending is beautiful, and clever, rewriting the past and resolving a loose thread fans haven’t generally paid attention to: an emotional thread connected with young Amy’s audition of yer classic Brian Hodgson Tardis, all the way back in the Eleventh Hour, on the first night she waited.